Pricing for cabins will range from $3402 pp non-balcony, to balcony staterooms from $4732 pp, then up to $5967 pp for a Veranda Suite. Prices include taxes and port charges, food and most drinks. The conference registration rate is $1600. Air inclusive pricing (from LAX) is available with a day room and ground transportation for an additional $1550 pp. Each stateroom also gets a $400 ship credit! 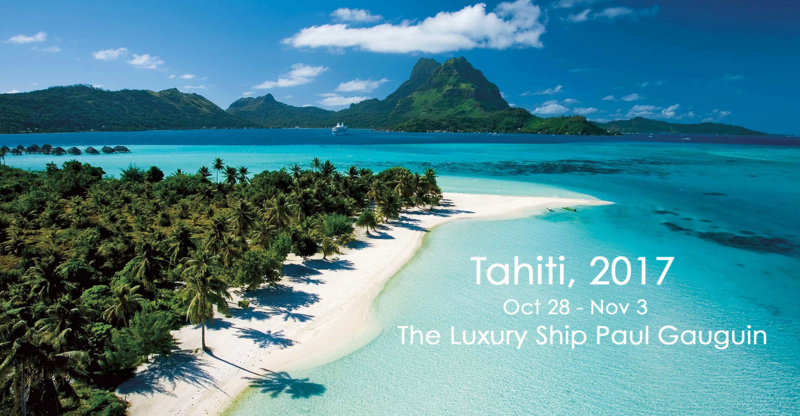 If you have not sailed on the Paul Gauguin, we invite you to explore Tahiti and French Polynesia in luxury that matches this beautiful venue. We are excited to offer a professional development program in one of the renowned locations on the planet … Tahiti and French Polynesia! Discover your own island inspiration in the destination that enchanted painter Paul Gauguin, author James A. Michener, and countless others. In one wonderful week, you’ll explore the best of the South Pacific, with stops in lush Huahine, beautiful Bora Bora, and postcard-perfect Moorea. Once you’ve made these islands your home—even if just for a week—they’ll always be calling for you to return.